Here's your chance to have Breakfast with a Red Wing - presented by Dunkin' Donuts. On Wednesday August 8 at 10 a.m., two winners plus a guest will have breakfast with a Red Wings player at a Dunkin' Donuts location. Spikes or Mittsy will be part of the morning fun too! The event is open to the public. How to become eligible for the drawing - no purchase necessary. A purchase does not increase your chances of winning. Two entries will be selected from all entries for each promotion period. Next promotion period: 12 noon EDT July 31, 2018 thru 12 noon EDT August 3, 2018 for the August 8 Breakfast event. Look for the July 31 Dunkin' Donuts Breakfast with a Red Wing post on our official Facebook page and comment with "Dunkin' Donuts Breakfast" before 5 pm, August 3. Share the post and you'll get an additional entry! 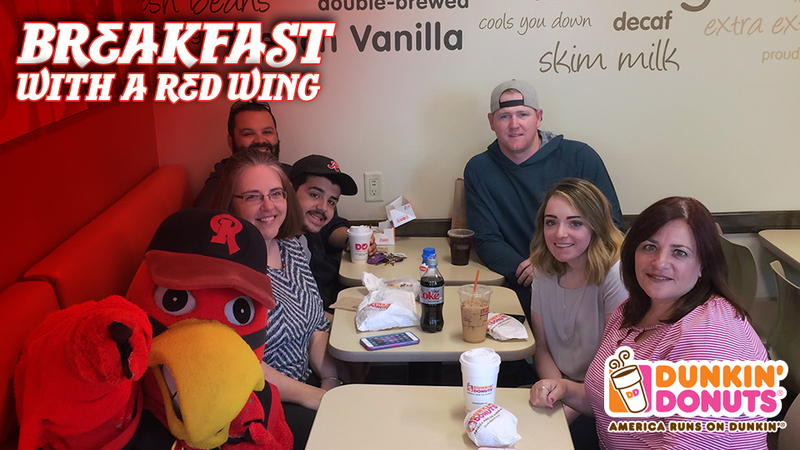 Look for the July 31 Dunkin' Donuts Breakfast with a Red Wing post on our official Twitter feed with @DunkinRochester and hashtag #BreakfastWithWings", and retweet it before 5 pm, August 3.
or drop it off at the Red Wings' main office at Frontier Field during regular office hours: 9 a.m. and 5 p.m. Monday through Friday, must be received by 12 noon August 3. Two Dunkin' Donuts Breakfast with a Red Wing winners will be selected at random from all entries on July 31, for the August 8 Breakfast event. Winners will be notified on August 3. Each of the two winners can bring a guest to the August 8 event. Prize includes one complimentary menu item and one complimentary drink for each winner and their guest, courtesy of Dunkin' Donuts. Transportation to Dunkin' Donuts is the responsibility of the winner. Entrants under the age of 16 must be accompanied by a parent or legal guardian if chosen as a winner. Full-time, part-time, seasonal and game day employees of Rochester Community Baseball and RCB Enterprises and their immediate families are not eligible to enter or win. Player subject to change due to the sometimes uncertain life of a minor league baseball player. The event is open to the public. Click here for DunkinDonuts.com - the official website of Dunkin' Donuts. Click here for a list of Rochester-area Dunkin' Donuts locations.